Shelling out thousands of dollars on a new watch just isn’t feasible for most people. But just because you don’t want to put a dent in your savings account doesn’t mean you have to nix the quality of the piece you want to add to the collection. Instead, just learn what to look for! We’ll give you some quick tips and details to pay attention to while shopping – and then you can sift through some of our favorites under $150 on the market right now. Check out our buying guide for quality watches below! Do go for Japanese movement watches or Quartz. Do look at fabric, rubber, or metal straps. Do watch it work. You don’t want to buy a dud, plain and simple. Do go for standard, whole-created designs; plastic or metal specifically. Don’t buy anything with fake metals or plated precious metals. This will fade over time, discolor your skin, and just appear to be cheaply made. Don’t go for the big names – it’s time to think outside-the-box. Don’t stir toward Swiss Made or with Chinese movements. Don’t imitate the most expensive designs on the market. Instead, find your own unique styles that you love. Even if you’ve never thrifted before, you have no idea how many happenstance gems you could find just by popping into a few stores – whether it’s a local spot or even a Goodwill. You could run into a designer piece for more than a fraction of the cost. *Quick tip: check out the locked cases in Goodwill stores for the items deemed “pricier” pieces. Larger retail stores – or department stores – always have really great sales going on and they carry multiple designers. It’ll be worth the look especially throughout the holidays when tons of specials are run. This is the most obvious spot to start your watch search. You can find a plethora of amazing – and inexpensive – watch designs by scouring the Internet. Although you need to be aware of knockoffs, and questionable “stores,” there are spots that offer a quality buying experience along with their quality watches. You don’t have to have a leather strap to have a quality watch. Instead, you’ll save a few bucks by looking at fabric or metal instead. Following up with no imitations – let’s reiterate that statement in another, important way – STAY AWAY from knockoffs. Lay off the extra features – such as water resistance – if you don’t really need them. Stray from the cheap trends. For example, extra-oversized faces and extra-fake gold tones won’t cut it. This beauty is a versatile design that can become an everyday watch but also play alongside your dressier nights. It has an automatic, stainless steel face and a black canvas strap with a price tag just below what we deem to be an accessible price for quality product. It’s truly an incredible value – just like its reviews show. If you’re looking for something on the trendier side check out MVMT watches, along with this Gotham piece and its super sleek charcoal strap, there are tons of other designs to sift through. But with this piece, you get a modern structure with water resistance. And there are options to add other straps as well – black leather and metal links. 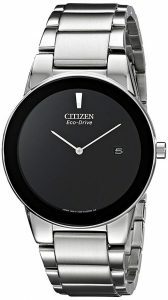 Citizen is another brand that most are familiar with and it’s a trusted source. Thankfully, they too have a lot of chic options that fit the budget. For something with a more sophisticated finish, check out this beauty. It has a Japanese quartz movement and features a stainless steel band. Over at Huckberry, you’ll find this military style watch for a super affordable price. Its design and mechanics is based on the standard issue Ministry of Defense for general purpose use. The face features illuminating numbers, hands, and quartz movement. 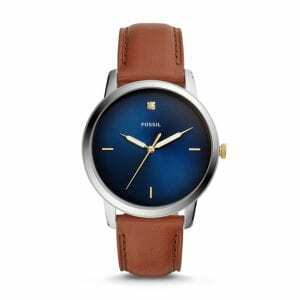 Fossil has some beautiful watches and this one is no exception. It comes with a blue satin dial, a diamond at the 12-hour marker, and a warm, leather strap. If you’re looking for a unique design, one that strays from classic black, this is it. We’re all well-acquainted with Timex watches – they’re trusty and timeless too. And this little number has an old-age, antique vibe with a price that will induce smiles. It’s a quartz piece that works as a great gift, especially for someone who is known to the game or someone who just needs a quick and comfy everyday piece for their collection. For those that are on the hunt for a showstopper, we just found the winner. This is a Michael Kors steal from Amazon and we’re swooning for the warm gold and black contrast. It’s water resistant, comes with a 2-year warranty, and has a chronograph function.